Here’s my favorite ice cream flavor recipe that I make in my Kitchen Aid Mixer with the Ice Cream Attachment. Most of the techniques and photos of them can be found on the French Vanilla Ice Cream recipe. 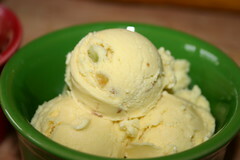 I really like the way that the pistachio and cardamom flavors compliment each other. In the small mixer bowl, mix the yolks and sugar until they change from a dark yellow to a light cream colored yellow and thicken quite a bit. It took me about three minutes, on medium speed. Stop to scrape the bowl every now and then, and quit when there aren’t streaks of the darker color left. Bring the milk, half of the cream, pistachios and cardamom pods just to a boil. (Chop the nuts fairly well so that the cardamom pods will be easily distinguished from them later.) Keep stirring the whole time, and turn off the heat as soon as it starts to boil. Let the mixture sit for 20 minutes, for the milk to absorb the flavors of the nuts and cardamom. Start a pot of water boiling. Use a pot that the small Kitchen Aid mixer bowl will fit into. I stick a ramekin on the bottom of the pot to rest the bowl on. Pour the hot milk into the measuring cup, and pull out the correct number of cardamom pods. Then s.l.o.w.l.y dribble the milk into the egg yolk and sugar mixture, with the Kitchen Aid turned to speed 3. It should take about five minutes to get it all incorporated. Stop to scrape the sides from time to time. Go slower than you think — it is an expensive and irritating mistake to go too fast and scramble the eggs. When it is all incorporated, it will be bubbly and frothy on the top. Move the mixture in the small mixing bowl to the top of your pot of boiling water, creating a double boiler. I found this is the only way to not curdle the eggs, again. Heat the mixture in this way, and stir continually until you reach 180Â°. Don’t heat it any higher, or it will curdle. It takes me about 20 minutes to reach 180Â°. Fill the regular size mixing bowl with water and ice, to create an ice bath. Put the smaller bowl into the larger bowl, put on the lid, and put into your refrigerator. This will get the ice cream base down to 40Â° really quickly, which is important. Let it sit overnight. This is when I put the ice cream attachment base into my freezer. The next day, whip the remaining cup of cream to stiff peaks, adding in the powdered sugar as you mix. Fold the whipped cream into the ice cream base, gently. When it is all incorporated, attach the ice cream attachment to the Kitchen Aid. Turn to “stir” speed, then add the ice cream mixture. It will be done in about fifteen minutes. Yield: A pint and a half. This is really rich stuff, so a small scoop goes a LONG way.